instructions below. 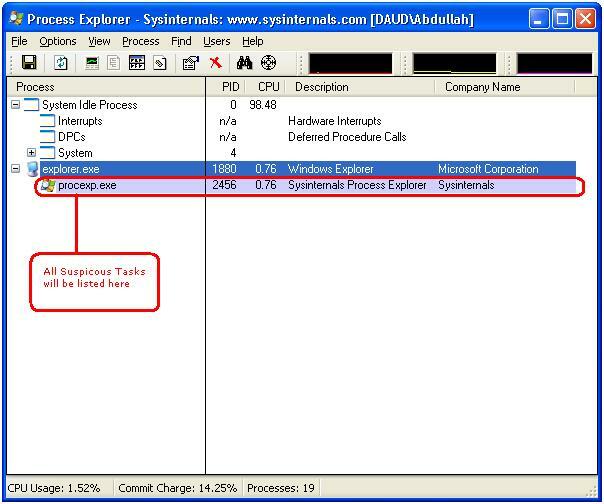 You need to have Process Explorer and Autoruns. Run and do as illustrated. If the same process starts again then suspend the process by right clicking on it and click suspend on the menu. Remove the name of the application from path now listing only folder. e.g If you have copied C:\WINDOWS\system32\mspaint.exe then remove mspaint.exe and you will see C:\WINDOWS\system32\ this in the Run Dialogue. Now you have successfully terminated virus process the next thing is to remove those virus files which run upon system start. Open Autoruns by typing autoruns in the Run Dialogue. Wait while refreshing completes. After scanning completes select Logontab and uncheck all the entries be sure do not unselect any Microsoft Entry.Restart system for the changes to take effect. Incase of any problem. you did a wrong move. Open Autoruns, in the Options –> Unselect Hide Microsoft Entries. And click Refresh button on the interface OR and select all entries .Close the program and start your system again. Raja Ali can you tell me how did you know you have virus and what problems do encounter due to virus. hello, how can i remove or recover my computer’s drive name and OPEN, EXPLORE….. ect to english from that unreadble form..
i have done all these things but no progress. but thanks for your guidence. THe PRoBlem IS A Same bUT LiTTlE diFFerNT .. !! i uSEd THE WAy u mentioned how to fix folder option i go to the regedit and do as u mentioned but there is 1 problem my HIDDEN value is not 0 its 2 when ever i change it to 1 , after a while it goes back to 2 .. ??!?!?!?!?! .. WHenever i open my Drive IT OpeNs In A NEw WIndOW ANd A DOwnloAD PAGE APPEArs ? !! ANd My NOrTOn AntI vIrUs ALSo DETECt a HACKROOTKIT ..:S:S:S .. HELP PLZZ ..
Shahan, you should scan your system with a free online virus scanner .. It will remove all the traces of the virus from your system. Only then will you be able to change that value and it will not be changed again. 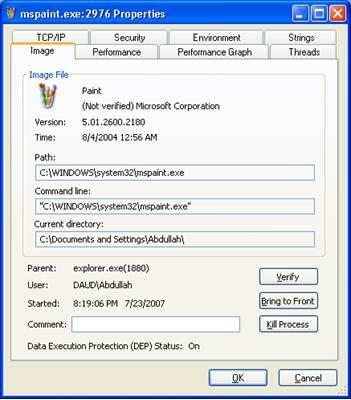 WinRAR and Procexp works perfectly & kills new folder virus and makes system clean as it was before.Thank you for all these virus removal tools–Great work. Mr.Muhammad Abdullah,thanks for Ravmon virus removal tool.I run the tool,it showed no Ravmon virus but my problem with folder options not being displayed is solved.Now I can see folder options. hi…. this very good software…..nd easy to use it…. hi! can you help me to find and to know “how to restore the missing folder and the run settings” pls e-mail me…. I’m changed show hidden files and folder to view my hidden fils but they already changed do not show hidden files and folder. how can i do that. i just want to open my drive such as d:drive with double click rather than explore it. hi i did everything written on this page.. and in autoruns.. i did uncheck everything visible to my eye.. its what you’ve said.. NOW!!! i cant log into my computer.. whenever i typed in my password it kicks me off after 3 seconds.. what will i do? pls help me. Blake, when you start your system, keep tapping F8 key for advanced boot options. Select “Last known good configuration” from the options. I hope this will solve your problem. i’m trying to do what you’ve instructed but i cant run regedit.. Earlier i resolved this problem by following your provided set of instructions and Ravemon removing tool. But, the problem is again there, and not removing. It worked & Icould see d hidden files , folders. But after system restart the same problem occurred again. I scanned my system with kaspersky antivirus and found not a single virus. I downloaded the Ravmon Virus Removal Tool 3.1.1. Congratulations, Your computer seems to be from Ravmon virus . If you want to restore some windows settings or want to remove the virus from USB Disk, launch the tool now. Select yes to launch or no to cancel. There was an error Removing Ravmon Virus. May be the virus has been removed already. Toget rid of the after effects of this Virus Use the restore windows dfault settings button. The registry value of hidden & showall was rolled back to 0 again. Ravmon Virus Removal Tool 3.1.1. didn’t work. Pl suggest me what do now ? 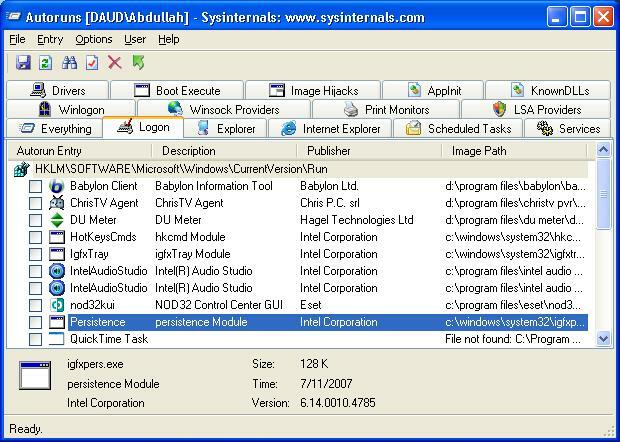 thanks a lot dude i m done with my hgidden files n folder thing now i would like to know how to enable my takmanager and remove newfolder.exe type of things..
Hi there one of the computers(its Windows XP Home) I work with contacted the Ravmon virus. Apart from the normal things this virus hides or disables, it seems to have somehow disabled or hidden Control panel. I used your removal tool and restored most of the the normal things this virus changes, however I cannot get back Control Panel, and when I double click on the c: in My Computer it Opens Excel. I cannot right click and go into Properties, it pops up with a error titled “Ristriction” saying “This operation has been cancelled due to ristrictions in effect on this computer. Please contact your network Administrator” PLEASE help and tell me how I can resolve this. This manual removal process REALLY WORKS. Thanks a lot. Keep up the good work. 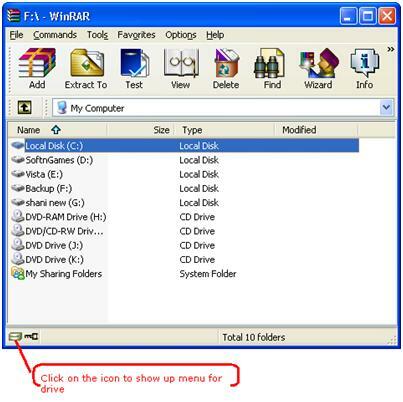 use Ravmone Virus Removal Tool to restore Windows Default Settings. Good Luck!! taskkill.exe /F /FI “IMAGENAME eq ssvichosst.exe"
*In some case, if this “taskkill.exe" file is not available in the windows\system32 directory (esp. in laptops), then try to get it from someone’s comp. If the registry entry below are not found, the malware may not have executed as of detection. If so, proceed to the succeeding solution set. 1.Open Registry Editor. Click Start>Run, type REGEDIT, then press Enter. 1.Still in the Registry Editor. Click Start>Run, type REGEDIT, then press Enter. 1.Right-click Start then click Search… or Find…, depending on the version of Windows you are running. GREAT HELP !! THanks alot everyone for such an informative website. It’s a great help. thank u very much. Thanks for this comments . I recieved your comments and helpfull for me . Thanks for your instructions! It worked well. I had the sscviihost.exe for quite some time now and your tips did wonders! how can I remove this virus forever? This messege comes up at the top of Internet Explorer 7 just like my PopUp Blocker. These messeges pop up constantly and all they do is take me to antivirus websites. how to remove The Indonesian Smile (your system safe) Virus ? I am not able to see my hidden files and folder, how can i remove index.dat file, how can i fat my pc also. This is very helpful. My doubts have been cleared. there is a virus in "power exes pack"
got a problem since yesterday. the so called virus remover 2008 is loaded in to my labtop while I was downloading materials. Then most of the system becomes unfunctional. Like Register editor, window task Manager , Display properties windowand others…..not working. Latter I tried to enable both …But this virus remover automatically poup different websites and loaded different malewares in to my PC and almost my pc is not working…….For this I tried to download spyHunter software and scan it. It shows me there are different viris in the registers, but it asked me to buy the licence to clean it. My problem is in our country there is NO systems to buy online …..and . Please could you tell me how to remove such things manualy from the registers? or any mechanisim that will remove……from my PC. My thesis document is in my Labtop and I am expected to present after two days. Please give me your hand as soon as possible. this smart virus software is good but it has to improve. the softwre is still not remove some viruses. you should add more features in it so it can able to remove some more viruses.although i like this software.good luck keep it up. – Can viruses infect monitor or printer ? – Does reformating the hard drive eliminates all viruses or some are so smart that they save themselves by re-installing themselves druring formating? Most of the viruses are removed just by formatting. For some viruses, we have to repartition. If you are formatting all your hard drive, it’s better to repartition too. my ystem was so slow working and virus has affected my system . task manager not show . I have tried all possible solutions (including yours) but it seems none of these really “actually” works. Yes, using PowerExes Pack kills the process, 7-zip removes the .exe file, and Autoruns prevents it from automatically opening. BUT THOSE DO NOT ENTIRELY REMOVE IT FROM THE SYSTEM. Being desperate about the matter, what I did is I inserted the Windows CD in my CD drive, went to Recovery Console, and tried to delete the .exe file manually since I know the path, thanks to PowerExes Pack. Fortunately, after changing the attribute of the file before it can allow you to delete it, it was gone from my system. On the other hand though, it left me with my Task Manager still disabled. Hope you can figure some tweaks to bring it back. Please i would like to inquire to you regarding the problem on my compputer, if i stolled AUTOCAD software on my system the problem will appear this the problem – (AVG miniport driver #2)I can’t stolled the AutoCad software couse this problem. ANTIVIRUS GOLD I ALREADY DELETED FORM MY SYSTEM, kindly give me a answer how to solve this problem? This solution looked like it worked for me. Great job!! Didnt see the symptoms of the virus again after doing all this but would want to wait for a day or two to see if this manual process has fully removed the virus from my system. I have problem, my computer got infected with viruses, I think I have gotten them all taken off but not sure. The problem I have is I can not change my desktop background now. All I can do is change the color. Can you help me? Thanks a lot, you saved my hopeless hard disk from a certain format!! I did all the process but my system restarts when I click for one folder. In that folder I have downloaded some softwares from Internet. I think virus is hidden in that folder. Ayub I think the folder that you’re clicking is not a folder. Infact it’s a virus. Open Windows Explorer (My Computer) –> Tools –> Folder Options –> View. Uncheck Hide extensions for known file types. Now you can easily differentiate between a file and a folder. 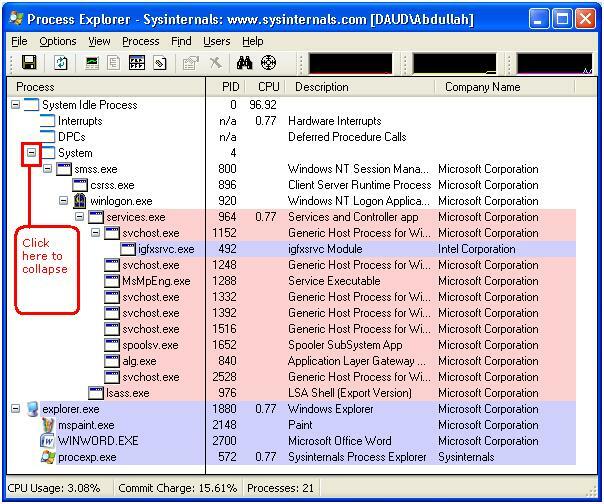 Observe the folder you’re clicking closely and see if it’s a folder or some type of exe file. If it’s an exe file, your computer is infected with a virus. I would recommend installing some good antivirus and scanning your full system. Open my PC one day found out got a virus. I ran McAfee for 5 mins and it shut down by itself couple mins after start scanning. Turn my PC on again and do scan online by TrendMicro HouseCall but same thing happened. It shut down by itself couple mins when I start scanning. Anyone have any advice how to deal with this? Many thanks.